Each receiver takes advantage of the latest sound and video technologies — such as the latest high-bit-rate formats, including Dolby(R) TrueHD and DTS-HD Master Audio(TM) delivered via Blu-ray Disc(TM) and the HD video content stored on iPod and iPhone products — and incorporates them into a beautifully designed, easy-to-use system. 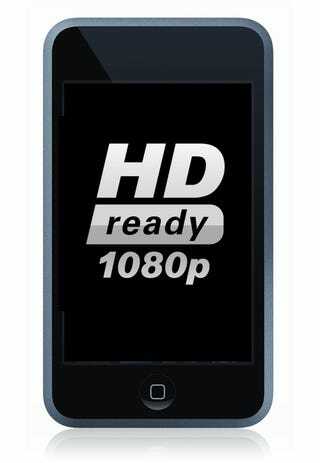 We knew that the iPhone 3GS has the power to play 1080p video, but this capability is not enabled right now. The video that gets transferred to your iPhone and iPod from iTunes is low resolution at this moment. There's no way to store HD content, and have it accessible to Harman Kardon's receivers. So, obviously, the company knows something that we don't.